Numismatics can be tricky. It's hard to know where to begin - the terminology and concepts are rather esoteric. 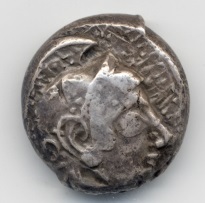 Nonetheless, coins are hugely valuable for the study of ancient history. With this in mind, the following resource has been designed. It consolidates a number of essential concepts into one place so you have a point of reference as you begin to explore Greek and Roman coins. Obverse refers to the side of the coin struck with the obverse die (see the following section). Reverse refers to the side of the coin struck with the reverse die. 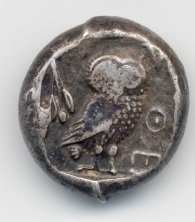 Type refers to the image on a coin. Legend refers to the writing (this might also be known as an inscription). Exergue is a space on the coin below the central design, usually delineated by a line. The field is the blank space surrounding the type. Dies are the tools used for stamping an image on a coin (see the following section). The flan/blank is the piece of metal placed between the dies for striking. The image on the left shows how an ancient coin was struck. The hammer strikes the reverse die, leaving an impression on the heretofore blank flan. As the flan is depressed into the obverse die, an impression is left on the other side of the flan. The hammer exerts more force on the reverse die. It will degrade quicker than the obverse die, which absorbs comparatively less force. The two dies do not degrade at the same rate. Thus, more reverse dies are required to produce large issues of coins. A practical side effect of this process is that, when complex imagery is shown, it will appear on the obverse die. This is because the obverse die will not need to be re-engraved as frequently as the reverse die. You would already be aware that coins, like any historical artefact, may be found on an archaeological site. Large quantities of coins are, however, found in uncontrolled circumstances. While a collection of coins buried together remains together, it is of extreme value for numismatists, and is often referred to for research purposes. Such collections can be found by amateur enthusiasts or dog walkers. They are referred to as hoards. For practical purposes the minimum size for a hoard is just two coins and the qualifying factor which creates a hoard is that the coins should have been brought together in a deliberate manner. Of course, most hoards consist of more than two coins, but size alone is not an important qualification for a collection of coins to comprise a hoard. Hoarding seems to be endemic and can be associated with every strata of society and with every sort of coin-using community. Within this wide spectrum, coin hoards consisting of what might properly be called treasures coexist with trivial sums of low denomination coins. But the value of these hoards to their original owners may, of course, have been in inverse proportion to their apparent intrinsic value: the loss of a fortune to a rich man may be nothing compared to the loss of the price of the next meal to a starving one. The images on this page show how one might find coin hoards. They can be in large or small hoards, buried in soft bags which have disintegrated over time, or clay pots. All the hoards pictured here contain Roman coins found in England - the images are from the Portable Antiquities Scheme, which catalogues all sorts of finds in England and Wales. Nearly everyone has formed a hoard at some time or other. Maybe you don't know what to do with 5c pieces, so you keep them in a jar; perhaps you throw in some coins for every expletive you utter; maybe you're collecting for charity; maybe you just like collecting interesting coins. The ancients operated in exactly the same way. 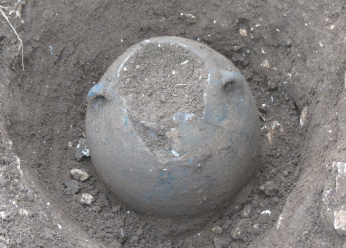 Not every hoard was buried as a form of 'savings' deposit, nor were they kept secret. Two of the most famous hoards were foundation deposits beneath the Apadana at Persepolis. There Darius the Great intentionally buried gold and silver coins as representations of the western boundaries of his empire and of his political and economic control of the regions. The proportion of coin denominations in a hoard can inform us about the economic climate at the time it was buried. 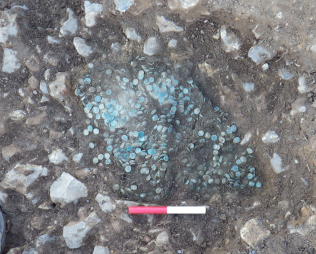 The composition of the hoard can enable us to establish a chronology for an archaeological site. The origins and find spot of the hoard may tell us about the trade power of certain cities whose coins journeyed vast distances before being buried. 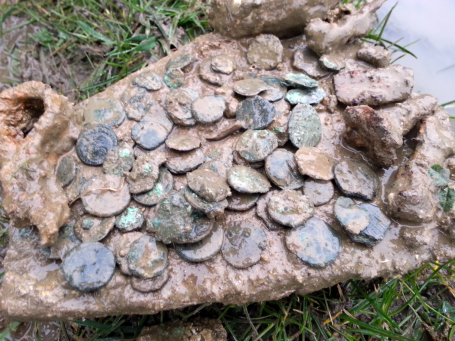 Hoards are incredibly important to our understanding of coins and wider history. The bronze as was the basic unit of currency in the Roman Republic. NB: The weight of the metal could change. Ca. 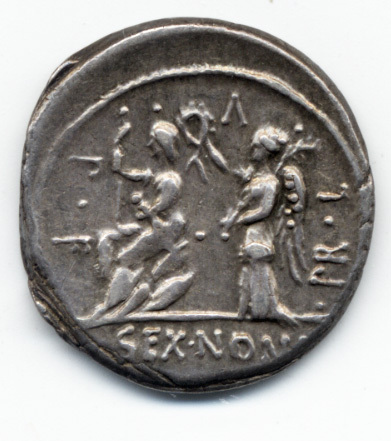 140 BCE the relative value of the denarius and as was retariffed. Before that time, an as was 1/10 of a denarius. Afterwards, an as was 1/16. 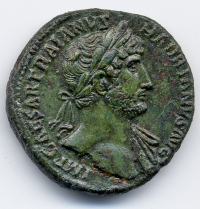 Even the metal used could change - the sestertius began as a silver coin, but became bronze in the Principate! It's all well and good to know the various denominations of Roman Republican coins, but what was their value? Our sources provide some hints of what could be purchased with your sestertii. In value for purchasing food, the grain-laws seem to have allowed each recipient 5 modii of wheat per month. Wheat cost (unsubsidized) about 3 sestertii per modius so that the cost of a month's wheat would be 15 sestertii, or just under 4 denarii; barley cost about 1/2 to 2/3 as much as wheat. - Lacey & Wilson, Res Publica. London: OUP, 1970. p. 328. In the 40s BC there was a prolonged agitation about urban rents. In 48 the praetor, Marcus Caelius, who proposed a year's remission, was driven out of the city by the consul, but only after bloodshed. Caesar, however, granted the remission in the same year, and perhaps extended it in 47, after further tumults, when barricades were raised, soldiers called in and eight hundred rioters killed. It applied to rents up to 2,000 sestertii in Rome, and 500 elsewhere, an indication that the cost of living in Rome was exceptionally high. 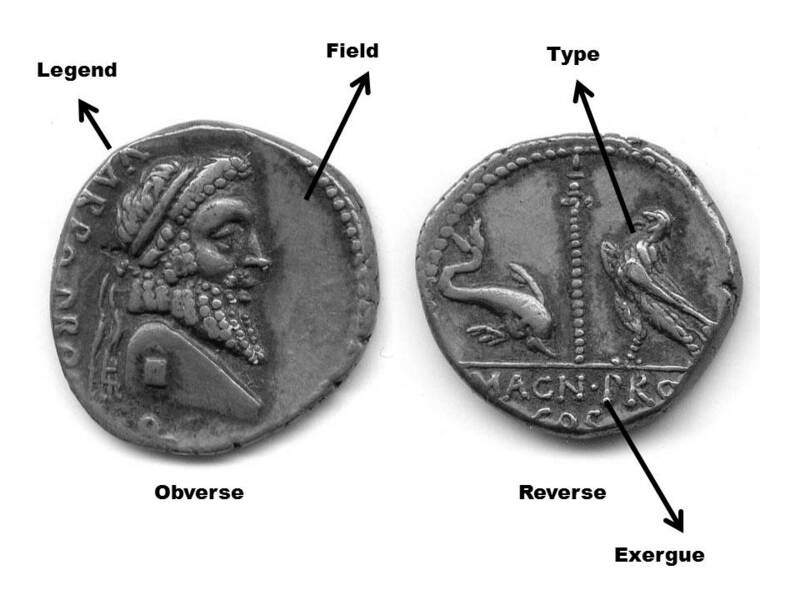 Coins often carry their own abbreviations - especially Roman ones of the imperial period. In Republican Rome, coin legends were often simple. The following list compiles some standard titles and abbreviations as they appear on Republican coinage. Part of our exhibition on the coins of Caesar discusses this important office of the Roman Republic.